It is now history. The first (and probably last) Bobsy Reunion is a done deal. Click the "Bobsy Reunion" Navigation button above to read all about it. 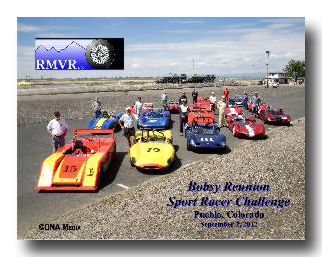 Don Anderson (California) and Bob Alder (Colorado) decided the time was right to rejuvenate available information on these neat vintage sports racers. Given that we are owners of Bobsy sports racers, we've decided to limit this registry to information on those cars, not attempting to cover the Vanguard Bobsy FVs, leaving that task to those with much more expertise, ambition, and time than we have. However, this website will also now cover the few (maybe only 4) Bobsy Formula Fords (FF) made by Jerry Mong in 1969. The author of this website, Bob Alder, acquired one of the FFs in January of 2018. Documenting these rare FFs seemed an effort worthy of sharing. A new page for the Bobsy Formula Fords has thus been added. You'll note on the Registry page, some cars are indicated as being for sale (Color coded in light blue). Unless the seller has specifically OK'd it, we don't show contact info (email or phone numbers) on the website to protect the owner's privacy. However, if you have an interest, please contact us (see below) and we'll immediately put you in contact with the owner. If you wish to directly contact any of the owners listed in the Car Registry, please send your request to us and we'll forward your inquiry to them if we have their contact information. We do it this way to protect the privacy of everyone and not splatter personal contact info all over cyberspace. As to Bobsy parts, we currently we have some information and are trying to develop even more. If you'd like to see what info we have, drop us an email request and we'll send it to you. Any input on parts sources, either some Bobsy parts you have for sale or a good supplier you know about, is most welcome. Let us know. We have three actual shop drawings of the bulkhead for an SR-2, circa 1963. The drawings are for the "Intermediate bulkhead," the "Instrument panel bulkhead," and the "Front half of the Front Bulkhead." The three drawings have been scanned into a PDF which could be sent upon request. An Email Group has been established for Bobsy Aficionados!! Follow the button on the Navigation Bar at the top (or CLICK HERE) to read all about "Bobsy Talk" and how it works, how to subscribe, etc. It's our own private email communications group. To review past "Bobsy Talk" email discussions, CLICK HERE to view the archive. It's even searchable. Note: You can't generate emails to the group from the archive. You must subscribe and then use email. Please use the buttons at the top of each page to navigate to the other sections of this site -- for instance the History, the actual Car Registry, Photos & Links , etc. Enjoy and please contact either of us by phone or email to contribute to the body knowledge about the whereabouts of any of these great cars, ownership information (past and current), pictures, sources of parts, etc. We don't hold out that all the info here is perfect, but we're trying and with your help . . . . who knows! And if you have a Bobsy Sports Racer in your stable, we'd love to have a picture of it to post for everyone to enjoy. If you have a "Mong-built" Vanguard Formula Vee, please to the bottom of the History Page for more details on those cars an about David Fillman's new fledging registry for those FV cars.